I don’t know about you, but I don’t often glance at my meters in instances. After all, I’m the only healer there. However, there are a few things you should be paying attention to in order to become awesomer. That way, when I hit the raids, I won’t be running OOM or anything nasty like that. Oh, the dirty dirty overheal! Mine is definitely lower than it was in Wrath, but it needs to be EVEN LOWER. I’m aiming for under 10%. Bwaha, it's under 10%. Last time it was closer to 15! Granted, some overheal we can’t avoid just by the nature of how certain spells work. If I hit COH and 4 people are hurt and 1 person is not, well there’s overheal on the person who doesn’t need the heal, but COH was still the most efficient spell for the situation. Also, here are people’s health bars at the end of a boss fight. Notice how much mana I’ve conserved. Notice how low their health is. HAH! If someone other than you is supposed to be dispelling something that you can’t, take a peek at this display. Make sure that they’re doing their job so you aren’t wasting mana “healing through” something that can be avoided. Then holla at the person screwing up. I get very little help, sniff. Look at damage taken. It should be mostly the tank. If someone else’s numbers are creeping up there, you have problems. This is the person who is standing in the bad or not managing aggro. What a good tank. What good DPS. Occasionally it is the tank’s fault for not picking up a stray add. NO, that was a trick! The add was supposed to be CC’ed! Remember, this isn’t wrath. 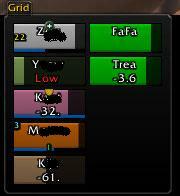 Damage taken is a good way to find culprits who are eating up your mana through unnecessary heals and yell at them. Or let them die. Or both. Don’t forget the death meter – great way for showing knowing exactly what killed you. True! Nobody died on my watch (go me!) so there was nothing to screenshot! But where’s the damage meter? I like the yelling.. there should be more yelling. The dispel counter/meter is definitely always interesting. People don’t value how much dispelling can actually help the healer. I wish I had a screenie of the previous night’s meters. 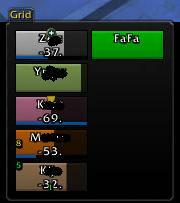 My overheal was worse BUT Rhii was in my group as DPS, and her dispel numbers were FAR higher than that pug-druid’s. DPS who won’t dispel are in my top three pet peeves. Back when I played a healer who couldn’t decurse, I had a LOT of fun with Lady Deathwhisper. Even after I swapped out for a shaman healer, I’d still have 10 or 12 decurses on that fight, compared to 0 for the resto druids and mages. It might be HEALING STREAM!